Have you ever came in the need to capture a webpage but not just the visible part of webpage instead, the entire web page? But to capture entire web page you have to scroll also as most of the web pages don’t fit in your 16:9 screen. You would have to scroll down one part of the web page at a time and capture then again scroll and capture and this goes on the whole length. After capturing all parts then cobble together all the pieces. That is just not a good idea, so what are your options? If you only need the data of entire web page then you can always go with the Google Chrome’s native option of saving the entire webpage as PDF file by pressing ctrl+p. But this native feature of Chrome only saves the main content area of the web page not the elements in the sidebar, header, footer, special effects. That too in a non-editable PDF format! 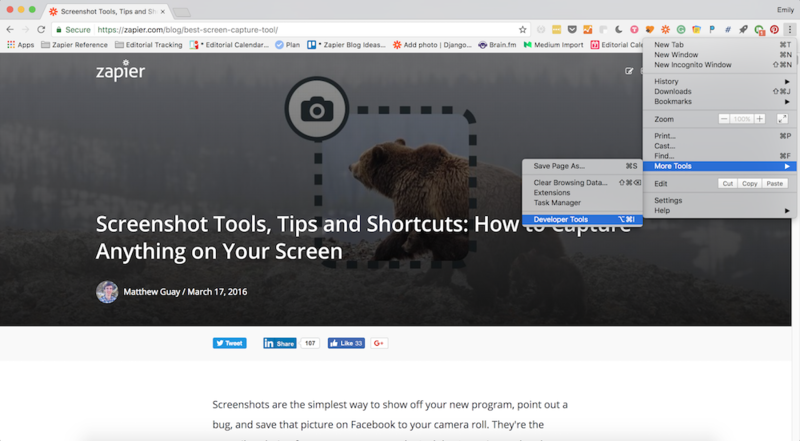 So you really need to take a screenshot of an entire webpage but how to do it? Let us get to two best methods to capture entire web page easily whether you are on Windows 7, 8, 10 or Linux PC or Mac. Step 2: Now type “screenshot” in the search bar and you will see three options for taking a screenshot, select “capture full-size screenshot” from options. On clicking on this option browser will pop-up to ask for save location. Set folder of your choice and you can find the full-page screenshot in the same target folder. The keyboard shortcut method is a great way to quickly get the screenshot you need, but if you want to customize the width of your screenshot, you’ll have to take a few more steps to get it. 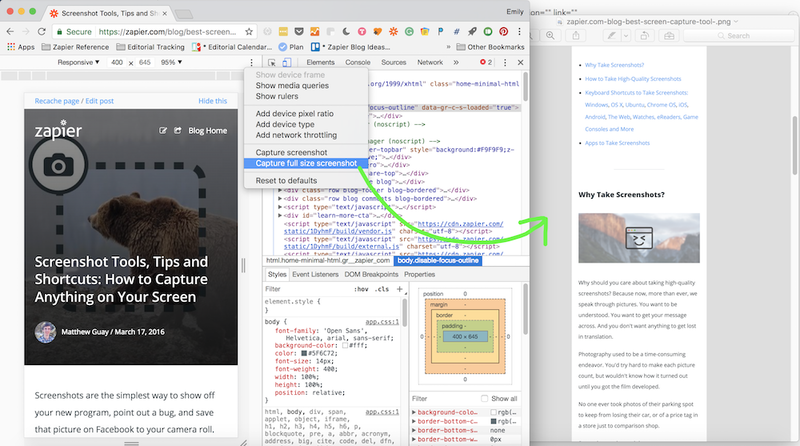 First, you’ll need to open Developer Tools in Chrome—the first step from before. You can do this by opening the “More Options” menu on your Chrome toolbar, or by using the shortcut Alt + Command + I on Mac or Ctrl + Shift + C on Windows as before. This will open a whole world of developer tools, including the surprisingly useful Inspect Element tool. But you’re looking for the Device Toolbar—one small icon in the top-center of the Developer Tools that looks like a phone on top of a tablet (or, two rectangles). Click on this to open a responsive version of the web page. In the Device Toolbar, you’ll see three options for your view: a dropdown menu (currently set to Responsive), the dimensions of the view, and the zoom level. Adjust these to customize your screenshot. Once you’ve done, you’re good to go! Step 3: Capture the Screenshot! Chrome will automatically download the full page. From here, crop as needed to get the image you need.